I have found some excellent sites and advice about how to host a wine and cheese party so I having been thinking about hosting too. I think it could be fun trying to figure out what kinds of wine I like and dislike first hand, rather than relying only on other people's thoughts and opinions. 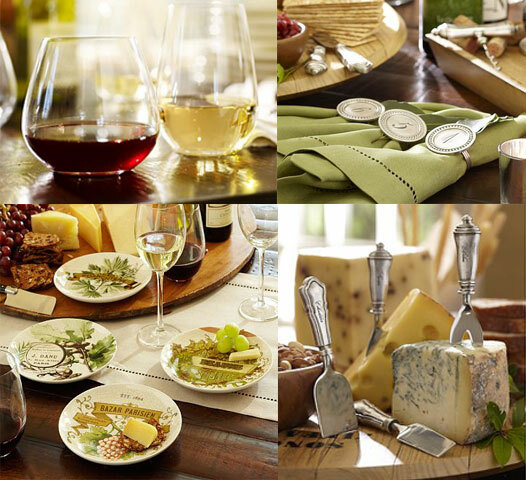 One of the best sites that I found while researching wine and cheese tasting parties was Pottery Barn. 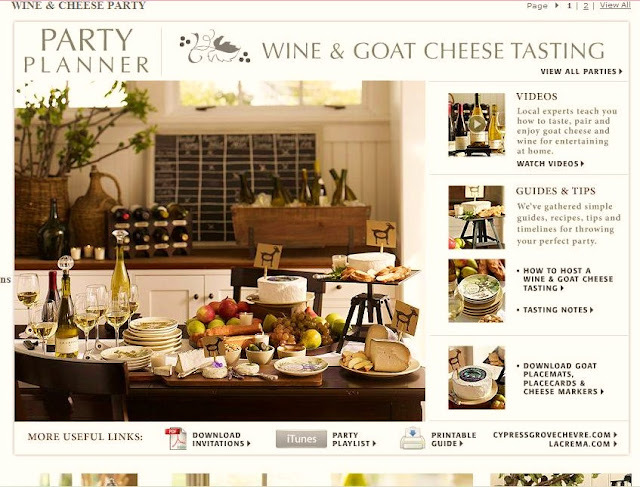 They have so many brilliant ideas and suggestions on how to host a great wine and cheese tasting party. The site includes a party plan with downloadable invite templates, a link to playlists on iTunes, planning guides, and links to other sites that go along with each theme (drink websites for cocktail parties, chef's websites for dinner parties, etc). The videos where experts offer suggestions on how to choose the right wine and food for a party are so helpful. Mr Attorney doesn't drink wine and a few of our friends don't drink either so I thought I could serve grape juice and non alcoholic punch. I also thought that I might set up little cheese and beverage stations in several places of the house. Small tables can accommodate a tray of cheeses, their matched-wines and accompaniments and some serving ware. This way our guests can mingle and meet new folks as they go along. Wine Intro has a great Wine and Cheese Pairing Chart full of excellent suggestions on which type of wine to serve with a huge variety of cheeses. Real Simple have a great guide on preparing for and hosting and wine tasting party. I love their idea of making invitation-coasters with a map of the featured wine region. They suggest downloading and print out a map from National Geographic's MapMachine, at nationalgeographic.com/maps. Trim, then use a spray adhesive to glue it to a piece of four-inch square card stock. Brilliant! 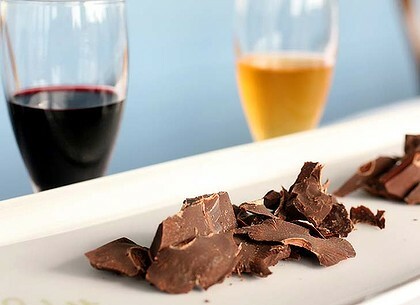 Chocolate that contains at least 60 percent cacao, which makes the chocolate richer. Sparkling wines go with mild, buttery triple-cream cheeses. Simple, young wines (sauvignon blanc, Sancerre) go with soft, young cheeses (goat cheese). Chardonnays and full cabernets go well with semisoft cheeses (Brie, Camembert). Medium-bodied reds (pinot noir, Côtes du Rhone) go with hard, stronger-flavored cheeses (Parmesan, Gruyère, aged cheddar). Sweet/dessert wines go with pungent blue cheeses. Beau Coup offered some great advice on preparing for a wine and cheese party and they even explore Wine and Cheese Party Etiquette. I wonder, have you ever hosted a wine and cheese party? Have you got any tips or suggestions for me on how to host one? If you have anything you can share with me I would so love to hear from you! Well, I'd better get organised...looks like I'm hosting a party soon! luv this post darl! we have had some informal wine n cheese parties back in the states generally a few weeks after a visit to amish country where we buy up big on all sorts of different fabulous cheeses! and we do fudge as well the cream cheese style fudges go well at a wine n cheese tasting! its a great way for friends and family to try new things they generally wouldnt try :) love the photos uve choose to share :) yum makes me hungry! Oh... this looks like so much fun! Such beautiful images. There is just something so golden about wine and cheese - earth tones and warm. oooh I'm loving this and my two girls are oohing and ahhhing over my shoulder. We love the idea of using NatGeo for the map invitations/coasters but couldn't figure how to print the maps off! Fabulous post full of stunning images and fab ideas. I haven't hosted a cheese & wine party since I don't know when, but I want to do it again now that I've read your post! natasha, this is a lovely post! thanks for putting it together. i love the chalkboard mat with labels. and i agree, these are some fabulous spreads. Wow Natasha! What a super post for us today. It must have taken you quite some time to put it all together, so thank you for that. Amazing photos and this cheese & wine idea does sound like terrific fun. Much more so than a boring old dinner party!!! I'm sure that if you are hosting it, it will be brilliant, because you will put so much detail into everything. Hugs. oh, that looks all so tempting and I love a bit wine with cheese and other nice things. The idea with the calkboard is outstanding. One can make that easy by himself with a board and special chalkboard color. 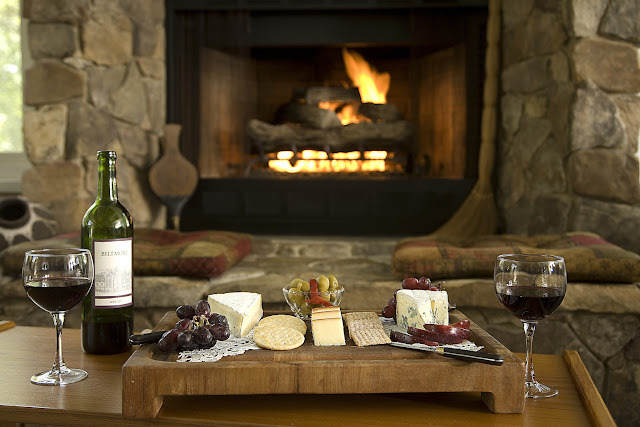 This was wonderful as Linda & I love wine and cheese and try to have some of both every day. Thanks for so many great ideas. I had no idea that wine and cheeses parties were so complicated. I do agree though, winter is a good time for a wine and cheese party. Although, do you really get winter up in sunny Queensland? Love it.... We are welcoming late spring, and early summer up here. And you are snuggling in for winter, down your way. :-) What a marvelous planet we live on. How fun. I have been reading some of your other posts and I just love that Kennedy home. It also reminds me of Ralph Lauren. Love the red white and blue. Oh wow, that sounds like such a neat and fun idea! I think a wine and cheese party is just the thing for bringing friends together without a lot of fuss. Thank you for all the great information and tips, your post itself is a wonderful guide! I'm hooked. When is the party? I want to attend. What a wonderful post! I love cheese along with a glass of wine, year round -in the winter with red, come summer (soon), I take delight in white. Adding fruit too! Beautiful photos! Since I'm a non-drinker, your idea sounds wonderful to me! Love, love cheese. Great photos with fabulous ideas. 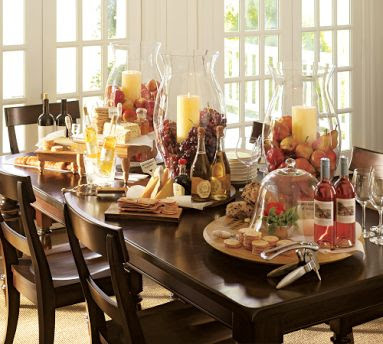 I've hosted several wine and cheese parties and wine dinners. In a few weeks we are going to one of my favorite vineyards for their spring fling. We always have a great spread of goodies in our group. Everyone has a different taste so you really can't go wrong with your pairings. Natasha..why do you have to live in Australia? I wish you were my neighbor. :o) What a great idea! My husband and I had a mini 'wine and cheese party' at a local tiny little restaurant and that's their specialty. The cheeses were superb! And we had live music. I never knew how wonderful it could be to try so many new cheeses and wines. Fabulous ideas! Chalkboard contact paper? Who knew there even was such a thing. I love that!! Great post. I am going to bookmark this to refer to later when I can have a tasting party. So many great ideas. Thank you. 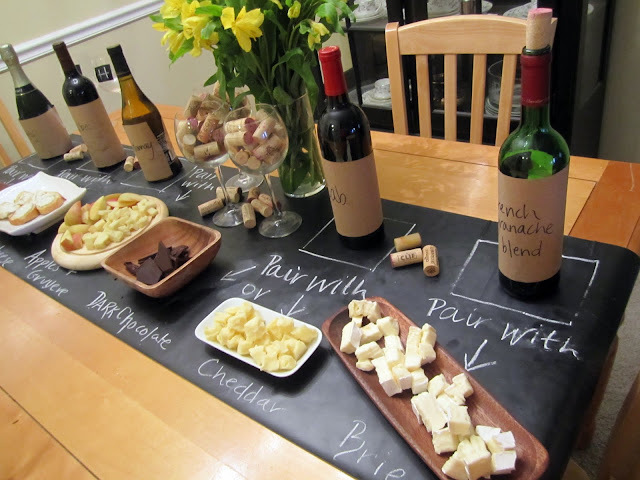 What a great idea - Wine and cheese Party! It sounds so delicious! First time here! Your photos are just amazing! Love your blog. This post must have taken you forever to put tohether! Thank you. That chalkboard on the table is brilliant! Simple - and brilliant! I am going to do that! GREAT POST! I know nothing at all about wine- Boonsfarm and Arbour Mist are my wines of choice, mainly because I don't know what to even buy! And the cheese - a few blocks of kraft - cut up with some Ritz crackers. Girl... I need help! Heehee! Looks like you've got everything you need! I had no idea they had so many items and ideas for a wine party. Love that chaulk table! Wine and cheese...what could go wrong? All those images were just stunning just think how simple and fun it will be. Looks divine - wish we could be there! I've been to several wine and cheese parties and enjoyed them more than a sit-down dinner. So much more relaxed and fun. Thanks for all your great tips here. I hope that people who don't drink wine shy away from this....I don't drink, but I can use every idea on this post. You presented it beautifully and made me want to have a happy hour filled with food and things that I love!! I must correct my post!! I meant to say I hope people who don't drink DON'T shy away from this..I need to proofread!! OOo - this is an awesome post! I'm pinning it so I can go back to it for our next Wine Tasting party!! Wonderful site and insights to hosting friends and family with wine and cheese. Our site is right along the lines of your thoughts in that with wine and cheese preparation and presentation sets the mark!